Now why haven't I thought of that before?!? Love it! That is wicked smart ! Love it so much. How wonderful for a rotating display of budding Picasos ! 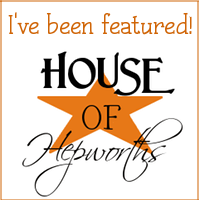 How have I not found your blog before now! It's incredible. I was going to feature one of your posts, but I can't copy any of the pictures. I can't really feature anything that I can't get a picture for. Am I doing something wrong or do you have something set on your blog that won't allow it. Anyway, REALLY cute blog and great ideaS! Hmmm I do see what you mean about the space below too, I don't have a suggestion for you though. Oh, I love this idea! 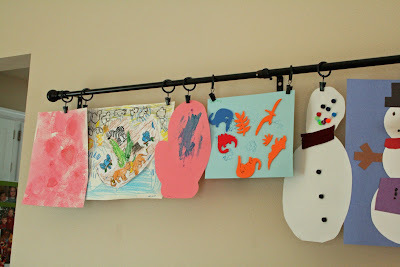 I was thinking of using a tension wire with clips to display art in our playroom, but this looks fun too. About the open space below it...could you just add a second rod, so you'd have two rows for display? Oh! What a great idea! My 5-yr-old is totally into displaying her art, and her 2 3-yr-old brothers are totally into tearing them down! What a great solution! I stumbled on this from another blog and I just want to say thanks for the great idea! I am in the process of redecorating our guest room/play room and I think this is a great solution for over my daybed! The art will be up, but still be nice and contained when guests are here! What a great idea. I was going to do a clothes line display for artwork but this is more polished! Such a great idea - I've seen the systems from Ikea, too, and always thought it looked just a bit flimsy. A curtain rod is a great idea, because if you've attached it securely to the wall, you should be able hang lots of stuff from it (paper and otherwise)! That turned out soooo cute! The black rod really dresses it up a bit! I do something similar with wire and clothes pins so it looks more casual! I love it! I put a couple of those in my basement and my kids love putting their artwork on it. I love yours! Very Cute! I love your valentine garland also, and your wreath with the beads. That is a great idea!!! Love it! I love this idea! I'll have to keep it tucked away in my brain until my little one starts doodling:) Brilliant! This is such a great idea ... my fridge is getting over run with paper crafts & doodles! this is a great idea! I need something like this at my house! I am featuring this at somedaycrafts.blogspot.com! LOVE THIS! Why oh why didn't I think of this sooner? I have little clips from Ikea and used string for awhile, but I didn't like how the string drooped. Now their work is in piles...and I feel so bad! Now I need to figure out where to hang a rod. Thank you! What a great idea. Looks beautiful. Such a fantastic idea! Love it! 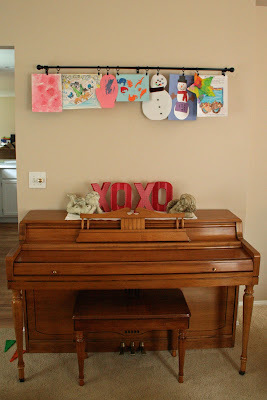 I put a picture of the one I put in my daughters room with a link to your blog today. Thanks! Genius! And looks nice too!